Amb. Danon tells Ban Ki Moon top PA negotiator paid visit to terrorist's family on December 5, after terrorist was killed. In the wake of the unremitting waves of Palestinian terror attacks, Israel UN Amb. 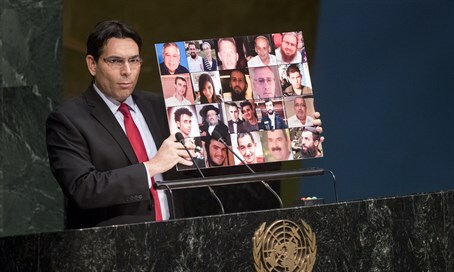 Danny Danon sent a letter to UN Secretary General, Ban Ki-Moon, pointing out that, “On December 5, Saeb Erekat, a senior PA official and an Abbas top aide, paid a condolence call to the family of Palestinian terrorist,” who had been shot dead after he fired at an Israel soldier and an Israeli civilian bystander, wounding them both. The Palestinian terrorist was also serving as a “Palestinian security” officer. PA Chairman Mahmoud Abbas just last month called the Arab terror wave, which has included the murder of 22 victims, a "peaceful uprising." In early September, he blessed every drop of blood shed in Jerusalem "for Allah" and called to stop "filthy" Jews from visiting the Temple Mount. In early October as the terror wave began gaining steam, Abbas's Palestine Liberation Organization (PLO) said that murdering Jews is a "national duty." In early November Abbas also ordered full military funerals be held for terrorists.